The Prince Cruise was designed after the traditional fishing boats of Bai Tu Long Bay, only on a slightly smaller scale with either 2 or 4 cabins. In our fleet, we have three Prince boats: Prince I has 2 cabins, absolutely suitable for a family of parents and children travelling together, cheering happiness of family in Bai Tu Long Bay. Prince II and III have similar design and service facilities to accommodate a group up to 8 persons, or couples sharing trips. Prince Cruise is designed with sophistication and a meticulous attention to detail for our guests enjoyment. Featuring 2 decks with dining area inside and outside, nice decorated cabins with sea view window, you will have nice time relaxing on boat to admire marvelous Bai Tu Long Bay in your eyes. Our crew with their warmest hospitality surely adds to your impression list. From the time you step aboard, to the time you check-in to your cabin, to when you are relaxing on the sun desk, you are surrounded by teak and oak – all constructed by our skilled craftsman. This makes the Prince, together with our Princess Junk, the outstanding member of our Royal family. I will never forget the anniversary and we will be back with our 2 boys in years to come, Thank you for the 2nd best night in my life. 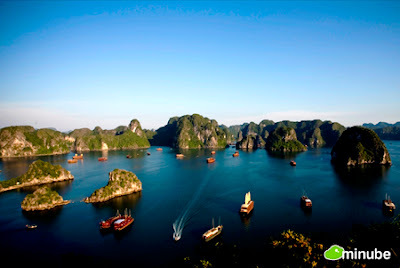 I am going to review the Prince III Junk in Halong Bay one more time (there are some users who are not sure if I am real, and I will try to steer you in the right direction and convince you I'm not a pawn). Anyway, we had booked the Lagoon Explorer and they told us when we arrived they switched us to the Prince III. I was very worried, but I think we got a better deal. It was amazing. We spent Nov 25-27th on the boat (Thanksgiving reference on an earlier post). We had a private bbq on a private beach, we kayaked (included) and had some of the best food of the trip. Go to Vietnam -- it is great. I'm hopeful when I submit this posting, that I will be able to add additional photos. We took the 3 day 2 night trip on the Prince II in late October and can highly recommend it. The cabins are very comfortable with large marble bathrooms. There are only 4 cabins and that was very nice as there were only 8 passengers. The crew members, especially the tour guide, were extremely friendly. Food was very good. The route takes you out of the heavily travelled area which is peaceful and great for photos. It was a great part of our 4 weeks in Vietnam.